There was a line around the block as FAO Schwarz reopened Friday after closing three years ago. 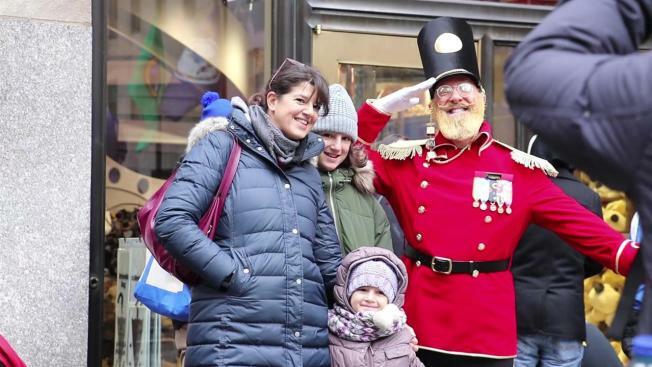 The holiday season is officially kicking off in NYC with the relaunch of iconic toy store FAO Schwarz, which reopened its doors early Friday morning. In a toy store like no other, there’s too much to do, so we picked the five best things to try in the new FAO Schwarz that you absolutely cannot miss. For the curious minds who can’t help be fascinated by science, the Discovery Science Lab is the place to see employees create cool experiments and chemical volcanic eruptions. The #MindBlown Discovery Lab demonstrates all the science kits FAO Schwarz sells round the clock, so customers can see exactly what all the science kits they sell do. Whether it’s building rockets, learning about rocks, or looking at some super interesting slides under a microscope, the Discovery Lab is a great place to interact with real-life science experiments that you can take home with you. For the child who is all about beauty and self-care, the Alex Bath and Hair Spa lets you take control by allowing full customization to any of the nail, hair, bath, or skin products they sell. Take a seat for a manicure or a glittering hair do with the help of the FAO Schwarz beauty employees, who can help add hair chalk, dye, and glitter to help you get into the holiday spirit. Don’t worry! It’s all washable. If that’s not your thing, create your own DIY lotion or bath bomb by combining different colors and scents to create your one of a kind beauty product. Washable tattoos, body stencils, and body glitter are also available to take home with you. The best part? It’s all scented! Have a need for speed? At the Race Track the FAO Schwarz pit crew will help you build your very own customizable racer, where details are decided by you. Choose the car, color, make, model, and all the little details in between to take home something specially designed for you. Before you go, the pit crew will add the final touch of a motor so that you can actually drive your car with a remote control once leaving the store. If you’re too eager to wait, take a try at the mini race tracks specifically set up so you can race against other customers in the store. Hoping to learn a few new tricks? Marvin’s Magic Corner is perfect for anyone interested in figuring out all the secrets of magicians. FAO Schwarz’s employees do round-the-clock demonstrations on how each trick works, so that you can learn a little bit even before you take the magic home! With kits on card tricks, disappearing rabbits, and mind reading games, you too can learn the in’s and outs’ of magic, and are sure to have something to show to your relatives this holiday season. The Baby Adoption Center takes interactive to another level. With the help of “nurses,” kids can choose and adopt a baby doll, to name and then take home. There’s a few steps they have to take first. With all new babies, interviews and adoption paperwork must be filled out, before a customer can select which baby they want. Not only do you get to leave the store with a brand new doll and carrier, but you also have the paper work to prove that you own her! Additional accessories like clothes, cribs, and beauty accessories are also sold so that customers can keep the fun coming even once they bring their new baby home.